This year’s exclusive Inman Global Connect event is going to be the premiere high-end real estate event on the East Coast. Tickets are going fast, and as stately as the Mandarin Oriental Hotel is, it can’t stretch to accommodate hundreds of thousands of Inman readers. That is why we’ve hand-picked nine Global Ambassadors to be your eyes and ears on the scene. Inman is the leader in independent real estate and technology news and events, and Global Connect will take place on April 6-7 at the Mandarin Oriental in New York City. Global Connect is an exclusive event where the leaders who build and sell the most prestigious residential properties will gather to discuss what’s next for luxury real estate, from the ground up. Ambassadors were selected for their outstanding work in the industry, their commitment to Inman’s core values and their influential roles in the luxury real estate market. “This inaugural group of Global Connect Ambassadors are on the cutting edge of how luxury real estate, technology and innovation intersect. Inman is extremely excited to collaborate with these highly successful industry professionals to bring our readers and attendees an engaging Connect experience,” said Jennifer Naval Peak, Marketing Manager at Inman. 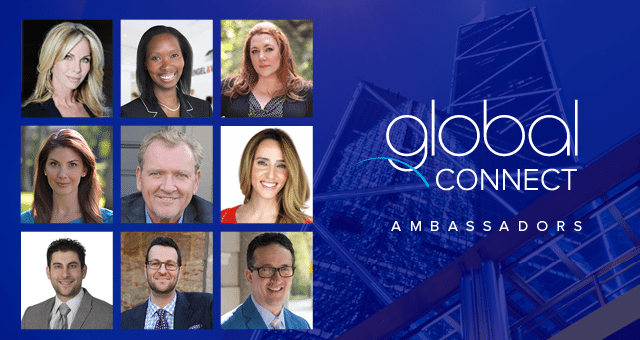 As the eyes and ears of Global Connect, Ambassadors are committed to enhancing and sharing the Connect experience with attendees and non-attendees alike. They will be providing live coverage and behind-the-scenes action through multiple channels, including Twitter, Instagram, Facebook and Snapchat. Cindy’s passion for real estate was embedded through her 20 years in the Entertainment industry–blossoming with her own investments in the field and the multitude of connections that arose through her diverse experiences. She has long been considered one of the most venerated figures in high-end luxury real estate on the Westside–culminating in her recognition on The Hollywood Reporter’s list of The Top 25 Agents in Hollywood. Over a decade ago, Nikki brought her expertise, experience and success as a business and technology consultant to selling real estate in New York City. She joined Engel & Völkers New York City in 2014 as one of the firm’s first advisors and is trusted and respected by clients and peers for her command of the local market and understanding how it intersects with the national and international real estate markets. Kellee Buhler has over 20 years’ experience in the New York market where she is one of the foremost brokers focusing on the sale of luxury properties throughout Manhattan and select Brooklyn neighborhoods. In addition, she has successful track record as a sales and marketing consultant for several local developers, and has worked on some of the most successful condominium projects in the city. Rebecca Cavallaro, an Associate Broker at Sotheby’s International Realty, is a native New Yorker with extensive knowledge of the City’s neighborhoods and cultural institutions. Her diligence, integrity, discretion and market knowledge make her an ideal choice for finding or selling a home in New York City. Michael has been representing both buyers and sellers in the Hamptons since 1998 and is an expert at listening to his clients, understanding the clients’ perspective and delivering results. He speaks about real estate with refreshing candor, educating clients to make sound buying and selling decisions rather than selling them on any particular deal. As a seasoned real estate broker, managing director and VPO for two regional firms and one national firm, Michael understands the issues that come into play for transactions, both large and small. Danielle established a successful career in both sales and marketing at business giants Disney and IBM before shifting focus to technology in the luxury market, specifically high end real estate. Her list of clients have included Goldman Sachs, UBS Wealth Management and Porsche, as well as many top brokers and brokerages throughout the U.S., international developers, and commercial real estate professionals. Anthony Mann, CEO and Founder of AM Open House, has been in real estate for nearly a decade. In July 2014, he launched AM Open House and has dedicated his entire focus on the AM Open House app and management platform to make the lives of agents easier, while supplying them with technology they actually want and can benefit from using. As one of the Bay Area’s real-estate record shatterers, Matt Zampella is on the fast track to the top end of the luxury real estate market. He has been recognized as one of the top 1,000 real estate agents by the Wall Street Journal and Real Trend’s annual rankings report, and he intends to continue as one of the youngest, most aggressive, ambitious and successful real estate agent in the SF Bay Area. One of the top brokers at Douglas Elliman and ranked #3 on the Westside, Paul Zweben is widely known among his colleagues, customers and friends for his humor, no-nonsense negotiating skills, and his excellent recipes and cooking videos on his blog, Hungry Domaine, on which Paul writes extensively about his 2 favorite topics, real estate and food.